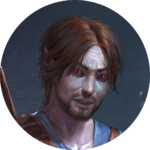 Talym Rend is a Dunmer mage and a main character in Isle of Madness. Kellen, a Moth Priest and the narrator of the stories in Legends, tells his traveling companion Nagh about the story of Talym Rend's descent into madness. In this tale, it is revealed that Talym Rend is the father of Novos, whose madness Talym resolves to cure by any means necessary. In seeking to cure Novos's madness, Talym struck a deal with the Daedric Prince Sheogorath, who wanted three souls driven mad in return for restoring Novos to sanity. Talym's journey brought him to the province of Morrowind, where he drove a famed Khajiit assassin, Zhanar Tabav, to madness near Necrom. He then went to a location which could have been the Telvanni peninsula[verification needed — Is this speculative in nature? ], where he convinced the Dunmeri Baron Navir that he was capable of performing miracles, leading to Navir's suicide in an attempt at flight. He then drove his friend and former employer Porcia mad, after planting false intelligence and convincing her to slaughter innocent priestesses of Mara in order to gain an antidote to a Reachman toxin. The lie cost her men their lives, and the needless slaughter of priestesses drove her to silence in fear of making similar mistakes, precipitating her descent into insanity. Once he had driven his three targets to Sheogorath's embrace, Talym returned home only to realize that Novos had been dead the entire time. When Talym set out to gain explanations from Sheogorath, he was only turned away. Unanswered questions ate away at his sanity as he wandered endlessly around the Shivering Isles. Eventually, he regained a semblance of composure and journeyed to Knifepoint Hollow. There, Talym was informed by Dyus, the librarian of Jyggalag, that he might gain an audience with Sheogorath if he retrieved an artifact of Jyggalag. He retrieved the Sword of Jyggalag and confronted Sheogorath. Sheogorath revealed that Talym originally came to Sheogorath to lose painful memories of his involvement in the Worm Cult's ritual sacrifice of Novos. This page was last modified on 26 January 2019, at 12:46.